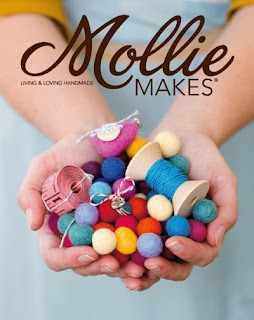 Mollie Makes is a new magazine aimed at people who love "making, thrifting, collecting and crafting". These happen to be my favourite hobbies so this description was certainly enough to convince me to purchase the first issue. Molllie Makes is an eclectic and aesthetically pleasing feast for the eyes; it perfectly blends vintage inspired crafts with elements of contemporary design culture. This magazine stands out alongside the shelves of other craft magazines currently available in the UK. Up to now the choice of craft magazines has been disappointing to say the least; most are old fashioned, uninspiring and to be frank a total waste of time and money. Some American craft magazines show potential but for a UK audience are always somewhat frustrating because of our differences in suppliers, fashions and terminology. Mollie Makes brings together beautiful photography, tasteful graphic design with content that inspires, instructs and observes the handmade lifestyle in a relevant and 'down to earth' manner. The way that it mediates between a craft and lifestyle magazine stops it from becoming overtly prescriptive or predictable and stimulates creativity. In the first edition I particularly liked the 'Happy Garlands' craft and a wonderful feature on how to have success as a seller on the online craft shop Etsy. The idea of showcasing someones 'workspace' on the back page is also a totally inspirational feature. Overall i found Mollie Makes to be quirky, fun and fresh and it will certainly appeal to the current generation of women (and perhaps some men!) who find the 'make do and mend' culture quite irresistible! ahhh i found mine in sainsburys!